One of the best social science books that I have read is NYU psychologist Jon Haidt's "The Righteous Mind". Recently Haidt has become well known for opposing what he sees as clampdowns on free speech and dissenting views on college campuses, the paucity or suppression of conservative views on these campuses and the coddling of students, but he is still primarily known for his writings on political psychology. As someone who describes himself as a moderate libertarian, I largely agree with Haidt's views on these matters. The basic premise of "The Righteous Mind" is that liberals, conservatives and libertarians use different moral metrics to judge the veracity and fitness of political candidates and of their world views in general. Their outrage or praise at statements that politicians make depends on how well or badly these statements score on their spectrum of moral values. Haidt's point is that most of the disagreement on political issues between liberals and conservatives boils down to a subset of six moral 'foundations' that they score politics on. The six moral foundations are: care/harm, liberty/oppression, fairness/cheating, loyalty/betrayal, authority/subversion and sanctity/purity. Based on several studies conducted by him and his colleagues, Haidt has concluded that in general, liberals value the first three values disproportionately while conservatives value all six values equally. Thus as an example, liberals get very worked up about the oppression of minorities because it scores very badly on the "care/harm" and "liberty/oppression" metrics, while religious conservatives get very worked up by LGBT rights because it scores very badly on their "sanctity/degradation" and "liberty/oppression" metrics. Libertarians view the liberty/oppression axis as being as overwhelmingly important. Haidt also refers to these moral foundations as sacred values, considering how intensely liberals and conservatives often cling to them. Seen through this lens of sacred values, it's very interesting to look at the Giant Conflagration of 2016 (otherwise known as the 2016 US election). When Trump said all those obnoxious things about Hispanics or women or Muslims, he scored very low on liberals' main moral values (the three on the left): by insulting certain racial or demographic groups, he was showing that he did not care about them, he was purportedly infringing on their liberties and he was also not being fair to them. 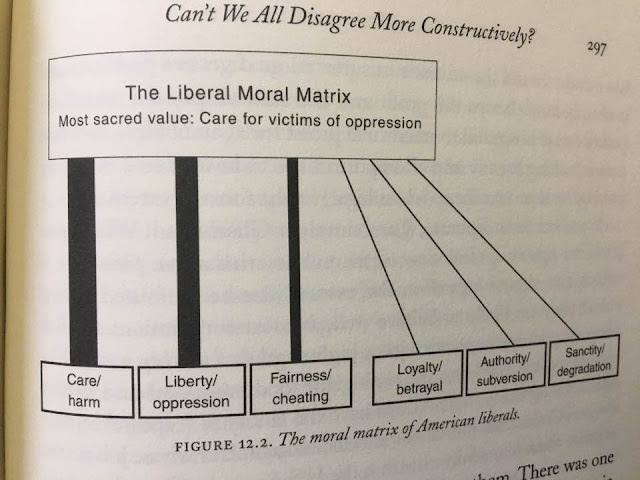 As the chart shows, concern for the care and liberties of victims of oppression is liberals' most sacred value, although it is also valued highly by conservatives. Minorities and women are often thought to fall in this category, and so the violation of this value disqualified Trump in the eyes of liberals right away. What they failed to realize was that he was still scoring very high on the three conservative values on the right. Many conservatives who supported him disavowed his words, but that wasn't why they would have a big problem supporting him. He was clearly showing loyalty to disgruntled working class whites, he was being an authority figure to them, and in some sense he also seemed to be preserving the sanctity of their way of life. It's not that conservatives didn't care about the left three values, it's just that all the supposedly disqualifying things he said still made him score very high on the values on the right. On balance he thus still scored favorable. The mistake liberals made was in thinking that his words would be as important to conservatives as they were to them, but because those words didn't really affect the three major values on the right that conservatives found important, they didn't matter much to them. It's a good case of missing the forest for the trees, and hopefully liberals won't make the same mistake next time. All six foundations are important, however, so liberals cannot be faulted for being angry at Trump's shoddy treatment of the three on the left; as Haidt says, even conservatives value these foundations. The next four years are going to be a giant experiment in testing all these moral foundations. If the worst that everyone thinks about Trump comes to pass, this country will be in bad shape. That would be because he would have failed on all six foundations: for instance, if he does not deliver on promises to bring jobs to the white working class, the moral foundation of betrayal/loyalty and authority/subversion which they have largely staked their support for him on would take a potentially existential hit. He would have then failed both liberals and conservatives. If on the other hand, he manages to actually follow up on the positive promises that he has made, especially regarding job creation, and also manages not to significantly hurt the other moral foundations on the chart, who knows, perhaps everybody would have been wrong about him after all. For now the best strategy is the one recommended by the Zen Master: "We'll see". Although I'm a liberal, I also found Haidt's book fascinating and well-written. However, I do have at least one criticism of his reasoning. Imagine if instead of the sanctity/degradation foundation, for example, he had found evidence of a green/purple foundation, in which morally correct people would always wear green and looked with contempt on anyone wearing purple. Maybe there was a historical reason for this concept having been adopted and followed; maybe it persisted for centuries. But the mere existence of such a tradition does not in any way imply that modern humans are obligated to accept this as anything other than a primitive superstition. So we liberals (at least some of us) did not necessarily fail to realize that Trump was scoring high on the three additional foundations - we just reject those foundations as an acceptable basis for a healthy society. I highly recommend Joshua Greene's _Moral Tribes_, which covers some of this same ground without the conservative slant. I assume that Haidt's foundations aren't aspirational, but a model (one of many that might fit) for how people behave. It makes some intuitive sense to me - for eexample, people are often attracted to each other because of their bodies, even though we tend to believe that we shouldn't; the attraction makes it possible for people to form relationships based on other, more enduring and rational bases. Similarly, people are bound through social mores; since the mores are general rules, to get people close enough to form better ties, they have to be pretty general to people. David Foster Wallace talked about TV not being high quality (in the 1990s) because, while people tend to differ a lot in their higher/more intellectual or multi-layered feelings, they tend to have very similar base feelings. It would make sense to me that social binding mores would form on similar bases. he problem I have is that there seems to have been an awful lot of bad logic and "Words don't mean anything" from people who liked Trump. At least some people have criticized liberals for their failure to engage people with whom they disagree or at least do not necessarily agree (although this is probably not solely a liberal trait - it was noted in a New Yorker article on the history of presidential debates earlier this year). That makes sense to me - there's an awful lot of arrogance running around liberals, I think. It seems difficult, though, to engage with other people (without preexisting agreement) if you can't agree on what words mean or what defines true and false statements. If you can't talk to people and understand each other, or you don't really care about what you say, than honest engagement isn't possible. Speaking in words that are only truly understood by your tribe also sends the (often not well-masked) message that other people don't matter. In a society where everyone doesn't have the same set of moral foundations, the preservation of open and honest discussion for everyone is the only way to be able to understand one another and to be able to compromise or to agree to disagree. If we can't do that, then Republicans and Democrats (or conservatives and liberals) are just a married couple not talking to each other and waiting for the divorce papers (most likely written in blood) to clear. Although I also reject many of these traditions because they conflict with my own preferences, it would be completely inaccurate to assume that the other three values do not play a role in imoroving society. In fact, many liberals view the body and the natural environment with extreme levels of sanctity/purity by eating only organic food and preserving the wetlands. Also, they are willing to turn over large amounts of their income to authorities in the form of taxes and are very loyal to their causes and President Obama. It is biased on either side and only fair when it benefits you. This is an excellent explanation for the evangelical vote. I am mostly socially conservative and in favor of small government, but I place a lot of importance on what a person says, so I was naturally conflicted by Trump. I was blown away that many of the older conservatives that I know could just ignore or dismiss those words, but I never considered that he could still be appealing to other value categories. Thanks for the post. I've never read Haidt's book, and what I know of it is from your article. But it seems to me that there is a major hole in this reasoning. Your example of LGBT rights is a case in point. 'conservatives get very worked up by LGBT rights because it scores very badly on their "sanctity/degradation" and "liberty/oppression".' Well, Yes on sanctity/degradation, but certainly most people would think that favoring LGBT rights would further liberty, rather than furthering oppression. Well, maybe conservatives feel that their liberty is being impinged upon by requiring them to tolerate what they regard as degraded behavior. But certainly LGBT advocates would point out that the conservative position is impinging upon the liberty of LGBT people to do as they wish. Come to think of it, LGBT people would probably view those who would limit their rights as degrading the sanctity of their individual choices and natural proclivities. It seems to me that for each of these moral axes or dichotomies, which ones a political group weights highly is less important than which people it deems affected. A group of any political leaning will select whichever high moral principle they can find to portray themselves as the virtuous party. On the care/harm axis, the Nazis and their followers viewed the Jews and other selected minorities minorities as harming them and their interests. On the authority/subversion axis, they viewed their Fuhrer as a logical and virtuous wielder of authority, whereas they viewed the Jews as wielding a huge and pernicious authority by secretly controlling, say, the banking system. Depending on your political views, you will happily invoke any of these dichotomies in such a way as to portray yourself as virtuous and your opponent as despicable. The distinction between the two sides is not between which principles are considered most important, but rather between which group each side views as being on the "good" side and which on the "bad" side of the dichotomy that best suits its rhetorical purpose. As a final example, one which could serve as a concocted reductio ad absurdum had it not actually occurred, Tom Perkins, of the VC firm Kleiner-Perkins, famously wrote, in 2014, ""Writing from the epicenter of progressive thought, San Francisco, I would call attention to the parallels of fascist Nazi Germany to its war on its 'one percent,' namely its Jews, to the progressive war on the American one percent, namely the 'rich.'" As a conservative, he appears to value care/harm and liberty/oppression as much as any liberal, but holds a rather different view than liberals do about who is being harmed and oppressed by whom.